IRVINE, CA--(Marketwired - Jan 13, 2015) - Toshiba America Information Systems, Inc., Telecommunication Systems Division (Toshiba -- www.telecom.toshiba.com) today announced its new IPedge® Virtual Server turnkey solution, which delivers the capabilities of Toshiba's IPedge business telephone system plus optional advanced contact center capabilities in a single server running a VMware® virtual environment. 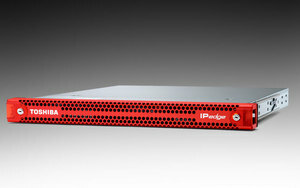 "Toshiba's new IPedge Virtual Server delivers the capabilities of Toshiba's IPedge business telephone system plus advanced contact center capabilities -- all in one server," said Brian Metherell, vice president and general manager of Toshiba America Information Systems, Inc., Telecommunication Systems Division. "An integrated communications and contact center solution makes it simpler than ever for businesses to run efficient and effective customer service." IPedge Virtual Server is a single-server deployment that combines core call processing and call distribution into one system with unified system management. This results in a simplified network with ease of administration and a reduced overall cost. Complete business telephone features -- Caller ID, call hold/transfer, speed dialing, conference calling, automatic redial and more. Voice mail with unified messaging -- Automatic call answering, a single inbox to manage email and voice mail, user-configurable mailbox options, and easy message management from virtually anywhere. Unified communications -- Presence and instant messaging, including federation with Microsoft® Lync® Servers and outside organizations using Toshiba UCedge® software. Plus click-to-call, CRM integration, call management from multiple device types, including Apple® and Android™ smartphones and tablets, and Windows® PCs and Mac® OS X® computers. Meet-me audio and video conferencing with Web collaboration -- Desktop and video sharing, Web browser interface, and integration with Outlook® Calendar. Mobility -- Follow Me call routing, simultaneous ringing of desk and mobile phones, and Apple and Android smartphones as phone system extensions using Call Thru or Call Back features. Hybrid networking -- Federation and feature transparency across a company-wide network of IPedge and Strata® CIX premises-based systems and VIPedge® cloud-based business telephone solution. Administration -- Embedded Enterprise Manager for Web-based personal user, single system and enterprise-wide administration of all applications. Advanced call routing -- Directs calls based on caller ID, agent skills, account numbers, time or date, triggers from ACD, user-entered data and more. Multiple call distribution methods -- Allocates inbound calls among call-handling agents using Linear, Round Robin, Longest Idle, Balanced Call Count, Preferred Agent, Skills-based or Agent Priority routing methods. Multiple group agent login -- Enables agents to answer calls for multiple groups, to provide important call coverage between groups and tiered service levels. Intelligent announcements -- Plays pre-recorded messages, informs callers of their place in queue or estimated time to answer, and offers alternatives such as going to voice mail or scheduling a callback. Interactive Voice Response -- Gathers and validates caller input, triggers responses, alerts agents when the queue gets overloaded with calls, and provides many creative application opportunities. PC integration -- Enables call management from a PC and synchronizes with the company's operations, CRM or contact software. Call Center reports -- Enables supervisors to analyze agent performance, call center group activity and system status as well as display data on a wallboard and forecast future staffing requirements. Network ACD -- Enables multi-site contact centers to work together as one integrated call routing system with agents distributed across the network. Multimedia Web Callback and Chat -- Enables online customers to request a callback from the company's website, with automatic redial when an agent becomes available; sales groups can assist users via online chat while placing orders from a Web page. Toshiba's IPedge Virtual Server not only delivers the features of IPedge, ACD and reporting, but it also simplifies administration and licensing. Toshiba's IPedge Virtual Server integrates ACD administration into the IPedge Enterprise Manager Administration software for automatic setup and ease of management via one administrator login account. Administration is fully Web-based, allowing the administrator to easily configure and manage ACD features, locally or remotely, from a Web browser. Licensing is simplified with a single license file that is activated once for IPedge, ACD and reporting. IPedge Virtual Server is available in three versions: with ACD integrated and licensed; with ACD pre-installed and ready to activate; or an IPedge-only version without ACD. Toshiba America Information Systems, Inc., Telecommunication Systems Division is one of the four business units of Toshiba America Information Systems, Inc. (TAIS) and offers business communication solutions for SMB enterprises and enterprises with multi-site or regional locations. Toshiba's VIPedge cloud-based business telephone solution supports up to 500 users, and the IPedge and Strata CIX systems support from 8 to 1,000 users and offer Voice over IP, voice mail and unified messaging, conferencing and collaboration, unified communications applications, networking, mobility and more. Together with Toshiba's PCs, tablets, copiers, and surveillance video cameras/recorders, Toshiba's Telecommunication Systems Division helps enterprises maximize business efficiency in communications and mobility. Headquartered in Irvine, Calif., TAIS is an independent operating company owned by Toshiba America, Inc., a subsidiary of Toshiba Corporation. For more information, visit www.Telecom.Toshiba.com. © 2015 Toshiba America Information Systems, Inc. All rights reserved. All product, service and company names are trademarks, registered trademarks or service marks of their respective owners. Information including, without limitation, product prices, specifications, availability, content of services, and contact information is subject to change without notice.